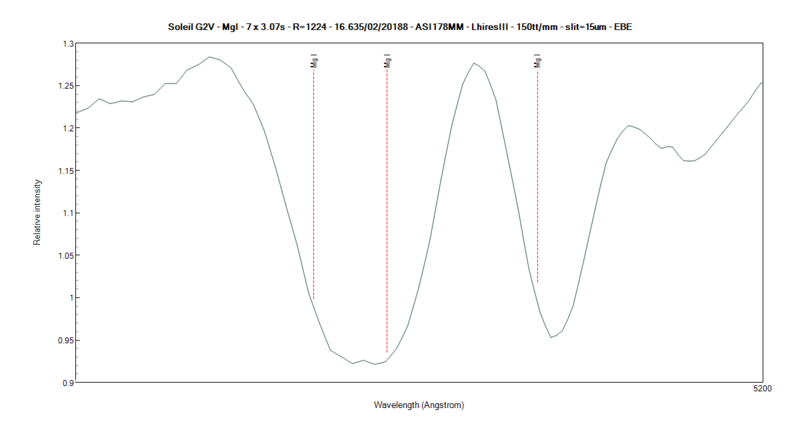 spectro-aras.com • View topic - Sodium doublet to calculate the resolution of ALPY? Sodium doublet to calculate the resolution of ALPY? When I calculate the resolution power with ISIS, I typically get values around 520 -560. I'm sure that I don't completely understand the concept of resolution, but I was asked how, with such low resolution, I could observe small values and small changes in the EW of Balmer lines. Can I use the sodium doublet to calculate the resolution? Are there any other lines that I could use? Re: Sodium doublet to calculate the resolution of ALPY? James, one of the advantages of EW measurements is that they are insensitive to resolution. While the line is broader at lower resolution it is also less deep keeping the area constant. Provided the line is not blended with other lines (the risk being higher at lower resolution) then EW is, at least to first order, independent of resolution. You should use lines from a calibration lamp to calculate resolution not the Na doublet which will is a blend of the two lines. This is an interesting question. Theoretically you should not be able to separate these 2 lines with the ALPY at a resolving power of 500 (12A resolution at the Na D lines) but there is some sign of a split in your spectrum. We can simulate this by taking generating two synthetic gaussian line profiles with a 12A FWHM using ISIS and summing them at different separations. At 5A separation there is clearly no split but at 12A separation we just see a split, confirming that the FWHM of the line is a good indication of the resolution. (The separation at which two lines can be resolved) This does not explain though why there is apparently signs of the D lines having been split in your spectrum, which is surprising. Perhaps it is just noise, perhaps the lines are not gaussian ? Can anyone offer any other explanation ? from which FWHM the doublet of fixed lines is separated ? We then are able to explore when Rayleigh criterion is checked or not (line observed are separated or not). Resolution power (RP) are computed for each line FWHM at medium wavelength of lines studied. 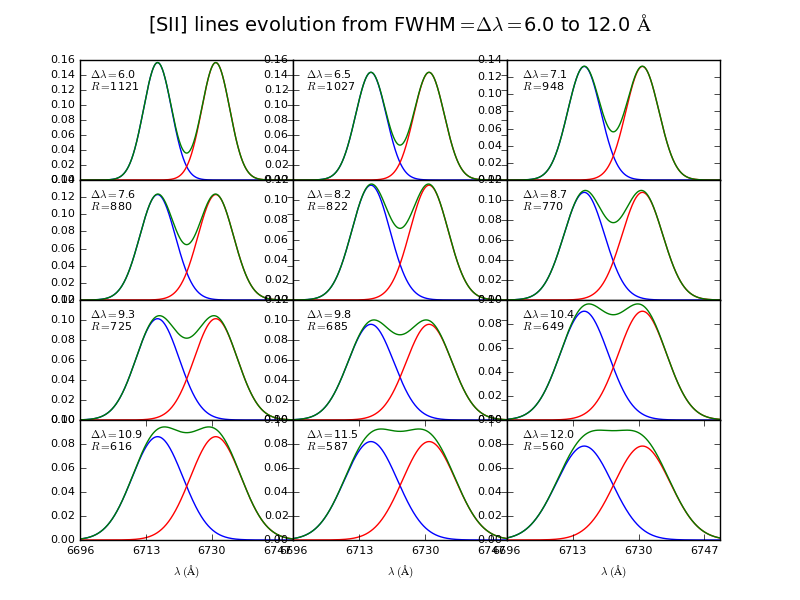 Rayleigh criterion appears to be verifed for FWHM<=4 A. So in James spectrum made with Alpy600 (RP~600), the two apparent absorption components aren't real lines. Moreover continuum noise around Na lines has same signal that the two absorption components. Thus, what James saw in his spectrum aren't Na D1 and D2 lines. These lines seem easier to resolve with Alpy600. 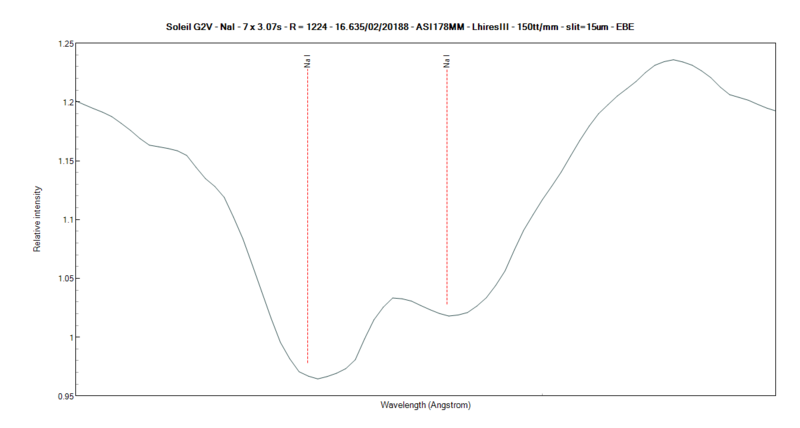 Rayleigh criterion appears to be verifed for FWHM<=9.5 A, ie RP~700. Of course, spectroscope internal focus on wavelength zone and slit used may impact on RP. Thanks to all for your answers to my questions. I do use the calibration lamp. The resulting calibration spectrum was used when I processed the spectrum with ISIS. I observed the star 2 days later and calculated a resolution power of 551.5. Here is the image from that day, with the data points labeled in red. I think that the data is well sampled and the peak between the two minima is not just due to noise. The calibration seems to be off by 0.3 nm. The H-alpha and H-Beta lines (shown in blue) are off by the same amount. This may be my mistake in selecting the H-alpha reference in ISIS. I don't know how to shift the whole spectrum. My question is that when I use the calibration lamp, the lamp fully illuminates my 23 um slit and I presume this impacts the resolution calculation. However, given my 2.4 um pixels, my 6" f/6 telescope and the (sub)arcsecond seeing that I can get here in Florida, often a star is maybe 1/3 the width of the slit. Could it be that the the calibration lamp, with its wider lines, is underestimating the resolution of my smaller star images? 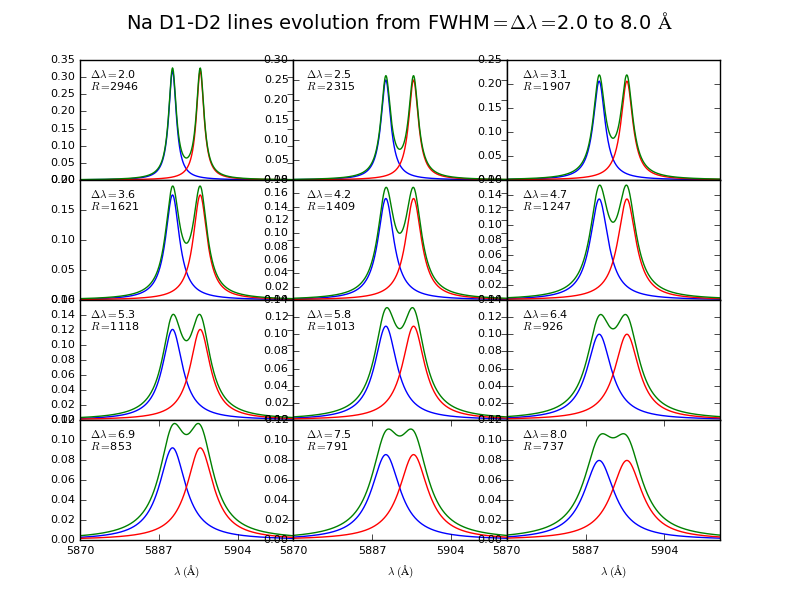 Could the sodium D1 and D2 lines provide an estimate of the resolution of the system? Thanks again. On your spectr, i think you have double pic absorption on the absorption ray at the right of the NaI, No ? Possible it's the small pixels of the 178MM amelior the resolution ? but with a slit of ALpy 23µm and resolution of 551 i dont know if it's possible to separat NaI? @ Benji, exellent your simulation on Python ! James Ley wrote: My question is that when I use the calibration lamp, the lamp fully illuminates my 23 um slit and I presume this impacts the resolution calculation. However, given my 2.4 um pixels, my 6" f/6 telescope and the (sub)arcsecond seeing that I can get here in Florida, often a star is maybe 1/3 the width of the slit. Could it be that the the calibration lamp, with its wider lines, is underestimating the resolution of my smaller star images? 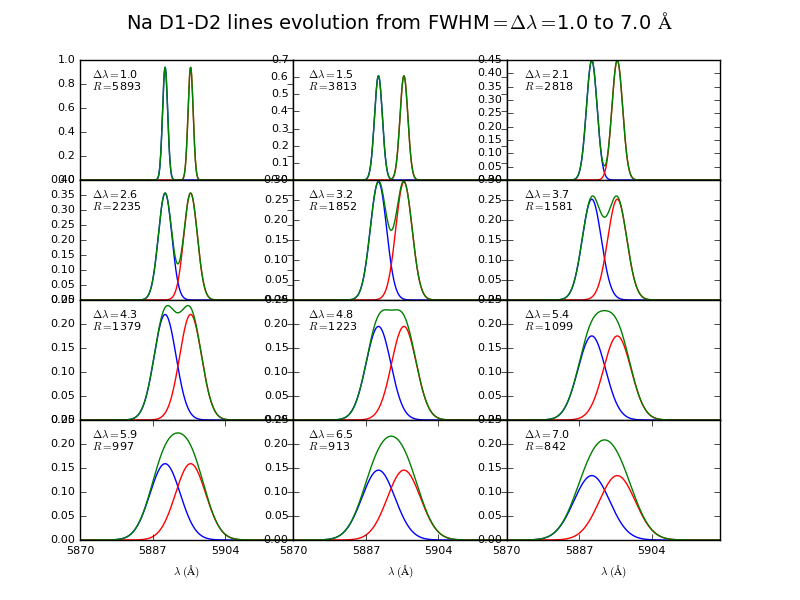 Could the sodium D1 and D2 lines provide an estimate of the resolution of the system? Thanks again. Yes I think this is the answer. If your guiding is good, you could get a higher resolution than the width of the slit. I now remember someone else seeing this (You are effectively running slitless). The problem is the resolution will be unreliable as it will depend on seeing and guiding. You will also get small shifts in calibration depending on exactly where in the slit the star is located. You should probably consider using a narrower slit which will give you a higher, more stable resolution and a stable calibration (Or a larger aperture scope of course ) I am very envious of your sub arcsec seeing ! Anyway, some of us have an uncommom seeing. Bertrand, I'm very suprised about your RP=1224 measured with Lhires3 150 l/mm. ETCL spreadsheet returns RP=834 for this grating+15 um slit and computed at 5890 A. You too have a terrific seeing? These observations lead me to give a try to an other computation. It seems that Na doublet is visible when FWHM<=6.9, ie RP>=853. 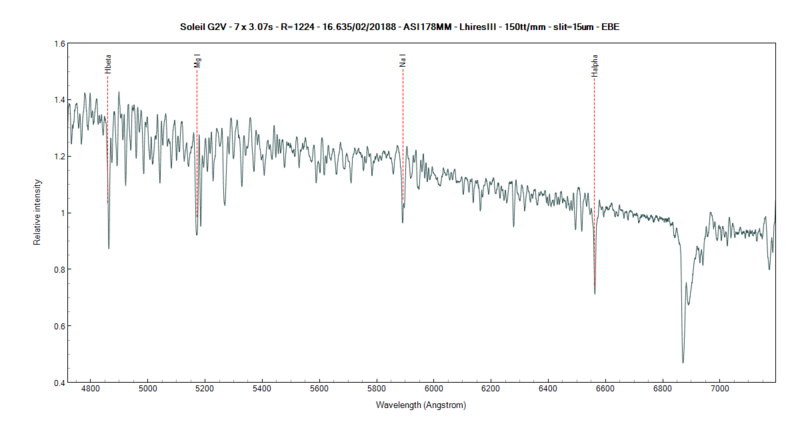 This result looks closer to observations but doesn't let us to choose between line shape modelisation or seeing as an origin of the visiblity of Na doublet at such RP, ie spectrographs.